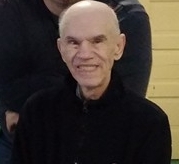 Raymond Precht, 65, passed away Thursday, January 31, 2019 at St. Elizabeth Hospice Center in Edgewood, KY.
Born and raised in Dayton & Bellevue, Kentucky, Raymond was a fan of sports. He spent many years of playing and umpiring softball. He was also an avid golfer and bowler, until his health began to decline. Afterwards, he resorted to spending his time enjoying sports on television, including his beloved U.K. Wildcats and Cincinnati Reds. He leaves behind his wife of 42 years, Susan (Spaulding) Precht; his son, Travis, daughter-in-law Roxanna, grandson Yonatan Precht; his brother Gregory “Gig” Precht; and many close friends. He is preceded in death by parents, Harry & Marge Precht, siblings George Precht and Pam Precht. Visitation with family will be at 11:30 a.m. followed by services at 12:00 p.m., Wednesday, Feb. 6, at Lighthouse Ministries in Bellevue, Kentucky. Floral Hills Funeral Home is proud to serve the Precht family.